This page documents the beginnings of my work on a transmitter I'm going to name "Hellraiser". Ultimate idea: Feld-Hell on 20m. 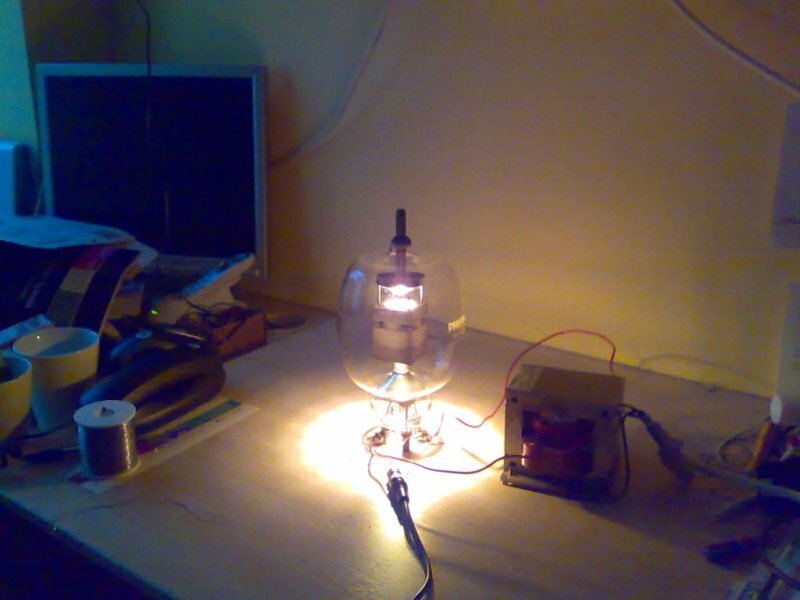 The valve is a massive TB4/1500 and I'm using a microwave oven transformer as a filament power supply. 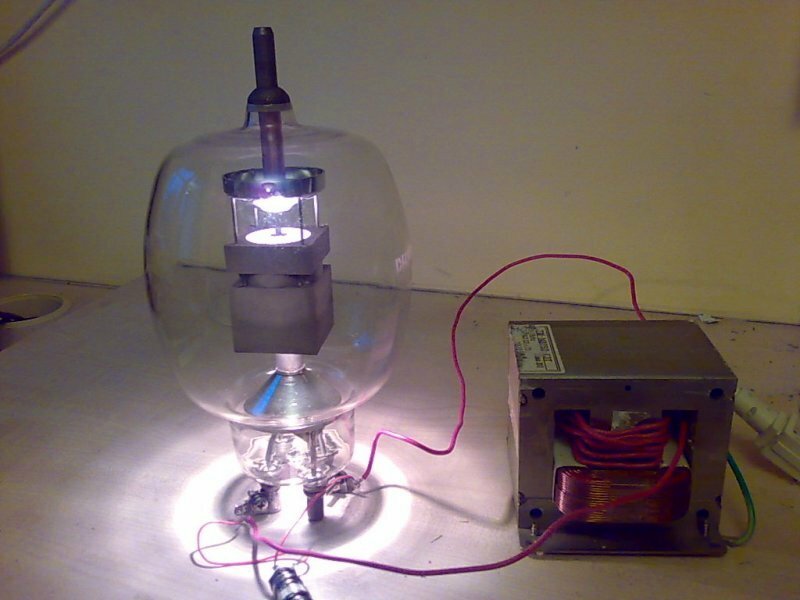 The filament transformer for this project is from an old microwave oven found, one of several found discarded in the neighbourhood. I read a few things about microwave ovens elsewhere on the internet. Apparently the first job is to remove the magnetic shunts. These are two packs of iron plates sandwiched between the primary and secondary windings of the transformer. To get them out, people recommend supporting the transformer ontwo pieces of wood. and hammering out the shunts using a steel bar of similar cross-section to the shunts. I have no wood, no hammer and no iron bar of similar cross-section. 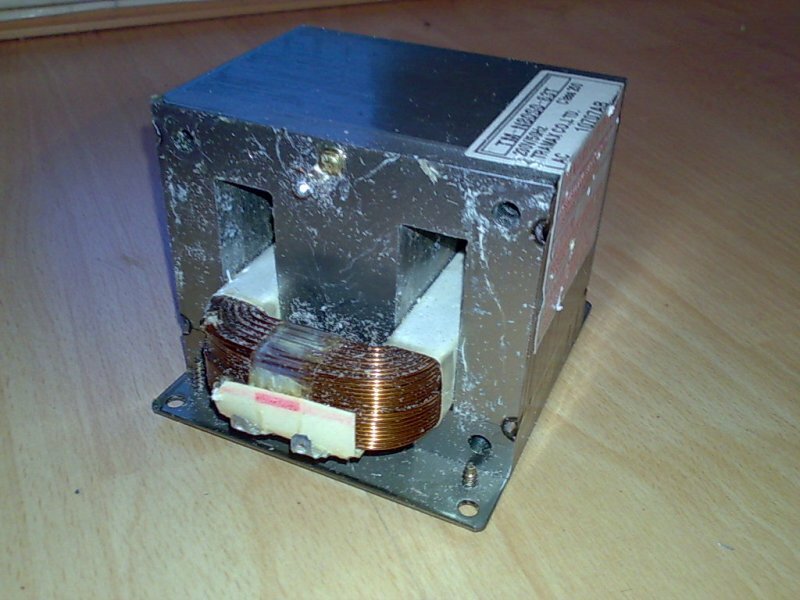 I do have a total of four microwave oven transformers and a piece of alumiinium roughly approximating the cross-section of themagnetic shunts.I used one transformer as a hammer and two as support stands. After a lot of effort and noise I was able to hammer out the shunts. Next job is to get the high voltage secondary winding off. That's thousands of turns of wire and turned out to be a devil of a job. First I went at the winding with wire cutters (see photo, left). But it was impossible to pull through winding remnants from one side to the other: the iron core of these transformers is huge and the windings are tightly packed, finalised by what seems like plenty of epoxy resin everywhere. 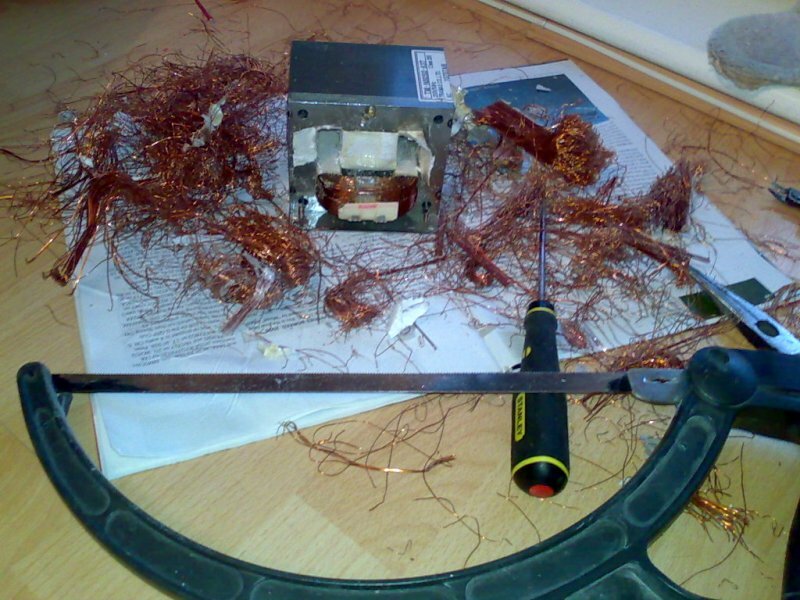 Next I read on the internet about someone using a hacksaw to cut off the secondary winding and tried this successfully. I was then able to knock through the remaining stub of secondary winding still in the middle of the core (more hammering). That was going Ok until my neighbour complained about all the banging, but I was able to remove the remaining bits of wire using a screwdriver and pliers. 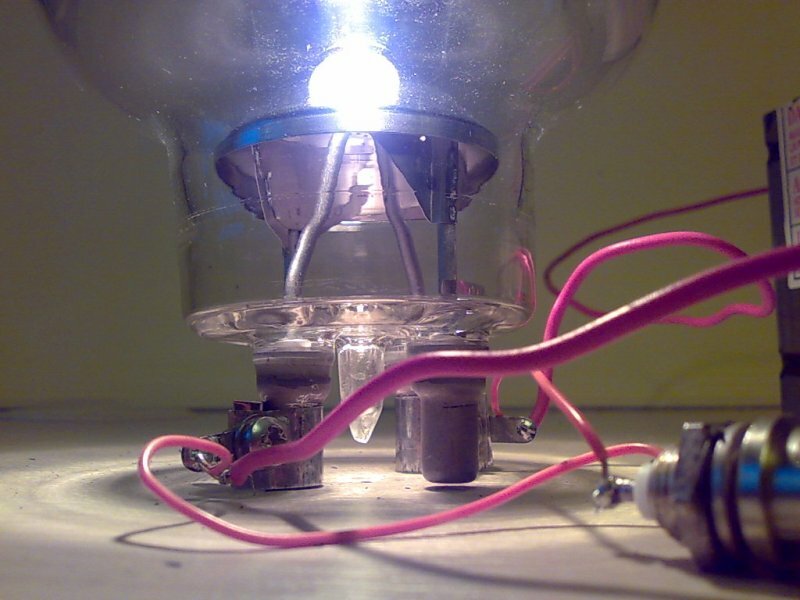 The TB4/1500 valve is a wedding present from my friend John VK6JY. John pointed out, on despatching this magnificent gift, that 99% of wedding presents are somewhat XYL related, but that this one was going to be a bit more OM friendly. Indeed it is! The TB4/1500 has a filament requirement of 5V at 32.5A. A massive 162.5W just on heating the filament! Read the datasheet here: http://www.mif.pg.gda.pl/homepages/frank/sheets/030/t/TB4-1500.pdf . This valve would be quite happy oscillating at 50MHz with 6000V on the anode and 500W of anode dissipation (over 1000W output!). Probably I won't get near those figures! 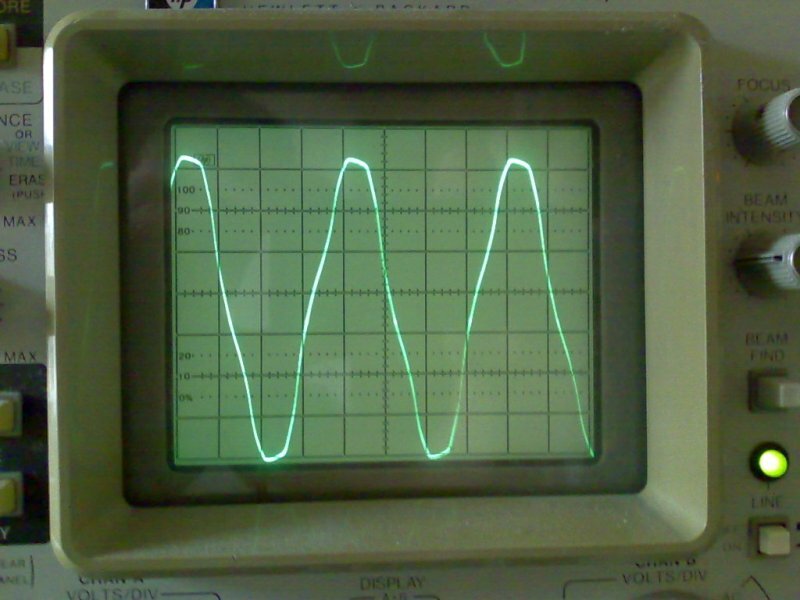 I wound 6.5 turns of solid-core household wiring cable as a secondary - this produces a peak-to-peak voltage on the 'scope of 14V which I calculate to be 5V rms for the valve heater. Of course I have no socket to suit the TB4/1500. I made some clamps to make the filament connections using two strips of tin can (ex-baked bean tin), each having with a hole punched in each end and a nut and bolt to fix it to the TB4/1500 "pin". The valve looks great! See the photos! 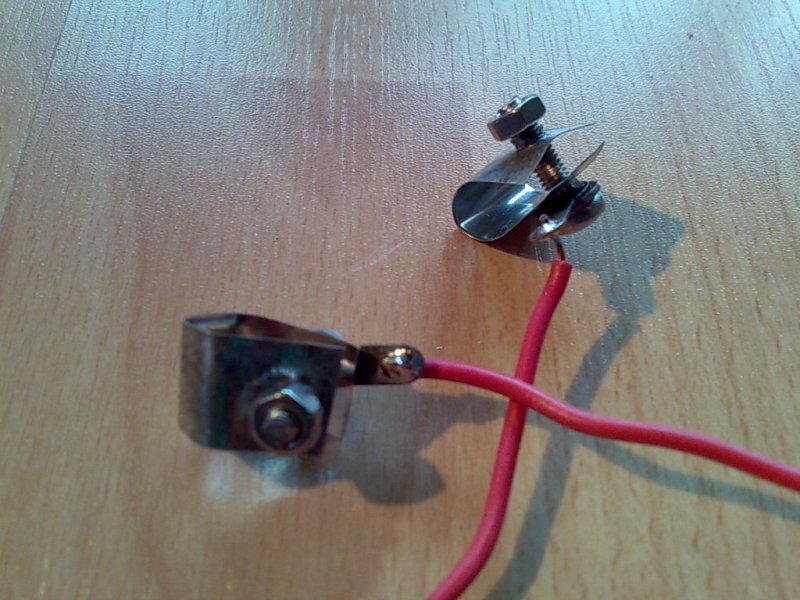 Unfortunately this secondary wire is evidently not thick enough to comfortably carry 32.5A. When the valve gets hot, the transformer gets hot, AND the wire that carries the current from the transformer to the valve gets hot, then you know there's a problem. Nevertheless I thought I'd have time before things melted, to take the photos. Which I did, marginally. Not long before clouds of smoke started rising up from the transformer and I rushed to pull the plug. 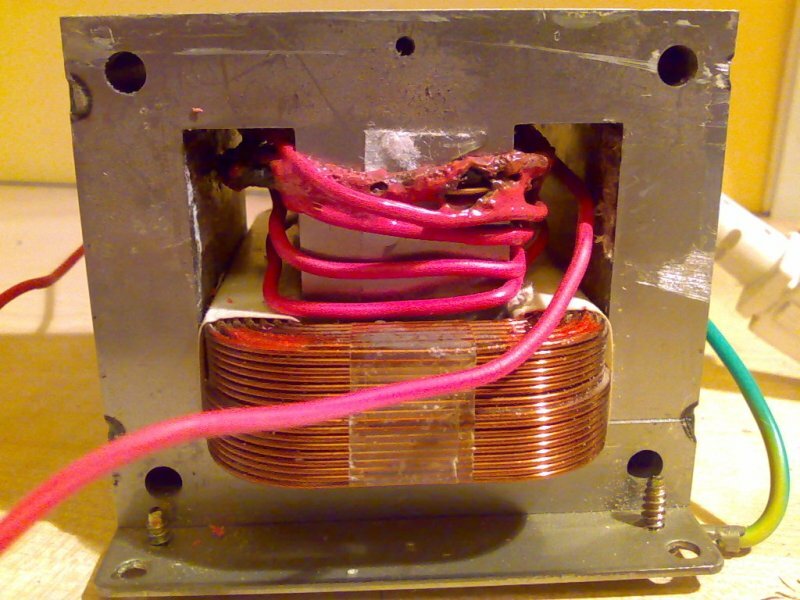 The secondary wire insulation had melted, resulting in shorts in the secondary turns and a runaway situation in which even more current was being dissipated as heat and even more melting, shorting, and smoke. Now I need to find some thicker wire before I can continue with the project.